Migraine headache finds research proven and effective treatment using homeopathy. Dr Shah's clinical work has been well documented. Contrary to the conventional treatment, which is governed by the use of painkillers, antispasmodics, more of symptomatic homeopathic treatment is targeted at the root level, which offers amazing results without side effects. The homeopathic treatment for Migraine is based on the individual case study of the patient's disease, its causative factors, the genetic pattern, mindset, etc. The treatment plans thus designed is addressed towards correcting the psychosomatic pathways and genetic disposition, in turn treating migraine from within. 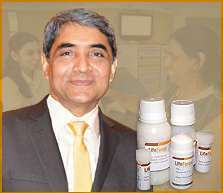 Dr Rajesh Shah, M.D. has researched on Migraine and other chronic diseases for over 20 years. His research-based molecules have international patent pending. His unique treatment protocol is made available to his patient's world over. At this point, there are patients from 127 countries under Dr Shah's care, which has been a world record. Severity and frequency of attacks. Drug dependency on conventional medicines. Most patients receiving treatment observe improvement within eight weeks. The total length of medication may be between six months to one year or longer.